Over 12 million pilgrims expected in Quiapo , for the great procession of the miraculous statue which will take place on January 9. Local leaders call on faithful "to respect creation, in order to turn prayer into a song of praise to the Lord for the Earth and what it contains". Manila ( AsiaNews) - The Archdiocese of Manila is preparing to receive around 12 million pilgrims for the traditional celebration of the Black Nazarene , which begins January 1 and ends on 9 with the great procession through the streets of the capital . To celebrate this moment of popular devotion , the Commission responsible for the preparation of the procession has called on the population to "collaborate" to avoid roadblocks and confusion. At the same time, the Eco Waste Coalition - a network civic environmentalists - has asked the faithful and pilgrims to "couple its popular devotion to care and respect for the environment." Last year , about 9 million devotees attended the march and left heaps of rubbish , which took over a week to clear . 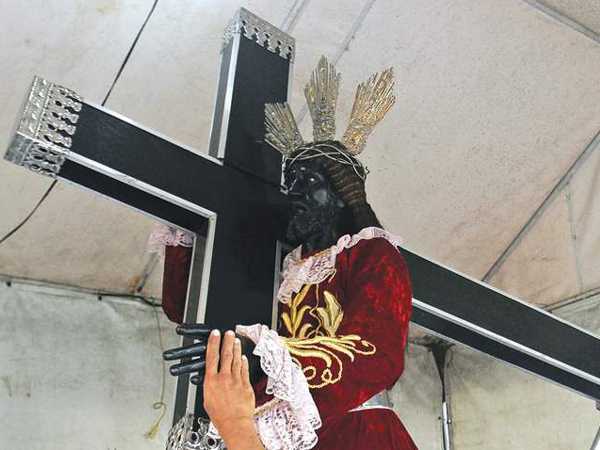 Tin Vergara, environmental activist, says: " Our devotion to the Black Nazarene is exceptional. , But we have to add it to care for God's creation , so that this beautiful festival is also a song of praise to the Lord for earth and all it contains . " The statue of the Black Nazarene represents Jesus bent under the weight of the cross. It was brought to Manila by a Spanish Augustinian priest in 1607 aboard a ship from Mexico. According to tradition, the boat caught fire during the trip, but the image of Christ miraculously escaped the fire instead turning black. Despite the damage , the population of Manila decided to preserve and honor the effigy . Since then , the statue is called the Black Nazarene and popular belief says people have been healed from diseases by touching the surface. Over the centuries, the aura surrounding the miraculous image of Christ has made it one of the symbols of the Filipino people. In recent years the bishops have given a copy of the statue to the Christians in Mindanao , too far away to attend mass at the Quiapo procession . The celebrations are held in Cagayan de Oro at the same time the capital of January 9 , the feast of the Nazarene, and Good Friday.